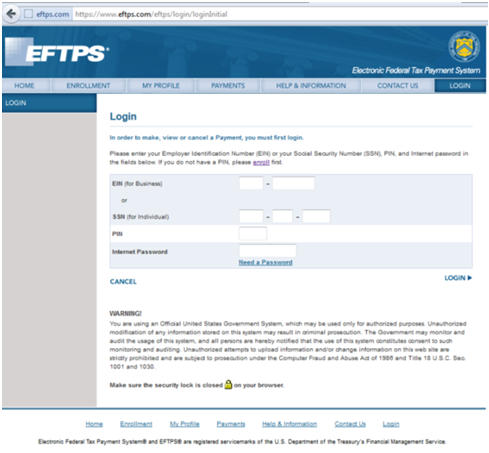 Electronic Federal Tax Payment System or EFTPS is a fast easy and secure way of paying your tax obligations. 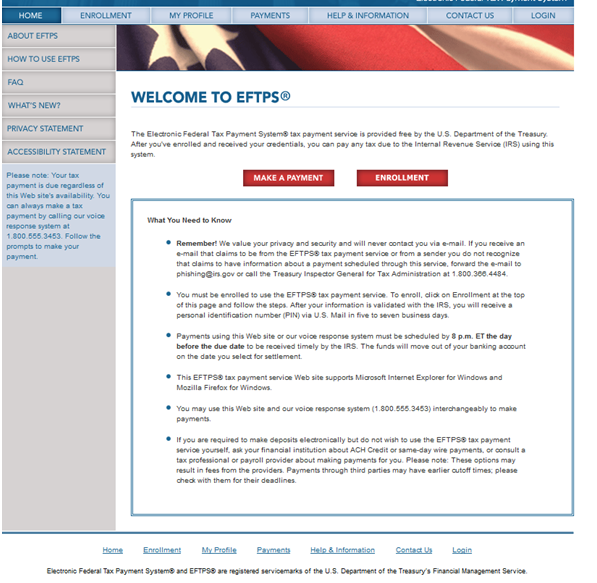 You can now make any IRS related payments by going to eftps.gov. First time users will have to enroll first. Click on ENROLLMENT. Enrollment is a four-step process starting by your agreement to the Privacy Act and Paperwork Reduction Act. 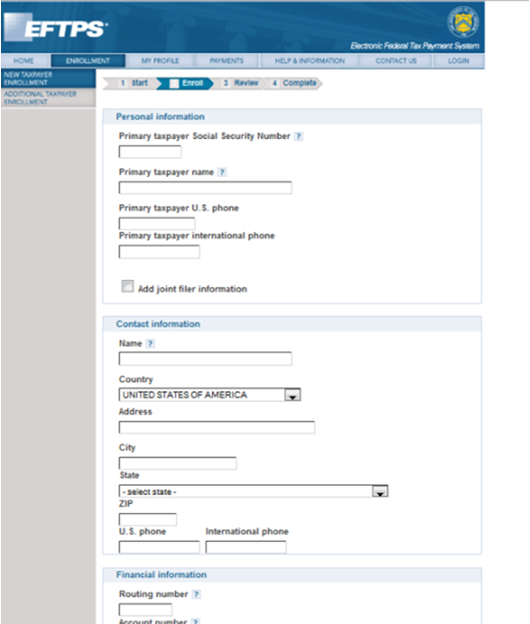 You then select how you wish to enroll: business, individual, or federal agency. During the enrollment process, individuals have to provide their personal information (social security number, name, telephone), contact information, and financial information. That includes your choice of checking or savings account from which payments you make will be deducted. You then have to review the provided information and complete the enrollment. Businesses trying to enroll in electronic payment method follow the same process. The only exception is the information required to complete the process. 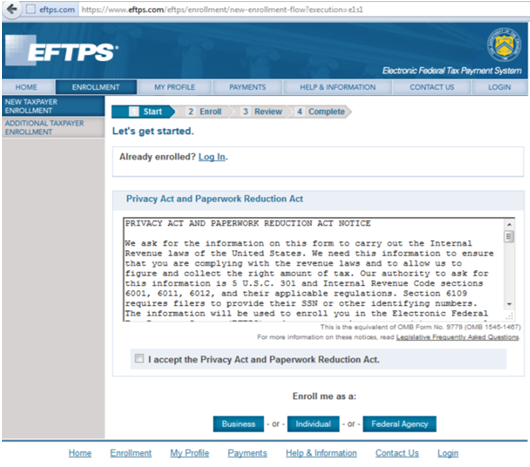 For federal agencies, this process is a bit different and can take a few business days. In all three enrollment situations, you will have to wait for a pin number issued to you by the IRS in order to access your account. You will receive the pin in mail and with that number you can access your account and start using all its features. Once you register, you can start making payments. EIN (for business) or social security number (for individuals). Internet Password (you create that). 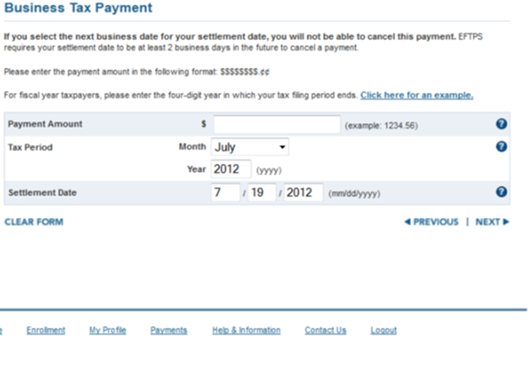 Your next step is to select a tax form for which you are making the payment. 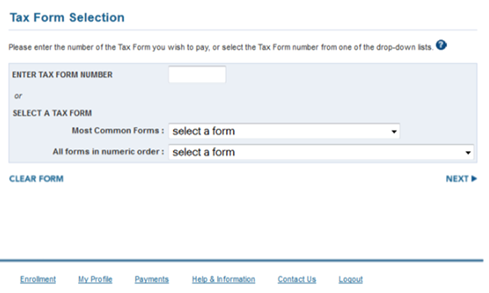 You can either enter the form number right away, or select one from the list of most common forms or by searching the entire list of available forms. Forms are listed in numeric order. Balance due on return or notice. Payment due on an amended or adjusted return. 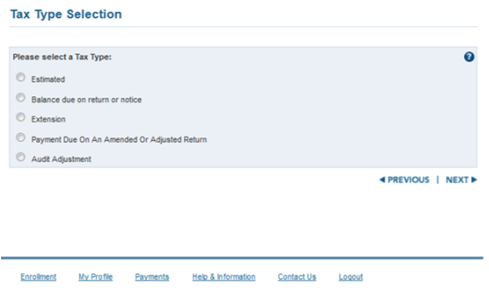 Finally, fill out the necessary payment information, and initiate the payment. When you make the payment, you can print a copy for your records or save a digital copy. Your account also gives you access to historical payments should you have a need to review them. At this point you can either make another payment, make another payment for a different account, or simply log out.